The evil servo is not so evil, but Norm is still AC less! The little silver thing is the expansion valve. The monovalve is usually on the fire wall near the battery. I do not know for sure, as my car does not have the servo. There is a little lever on the back that does NOT change position at all, even though it looks to be vacuum operated. Also I would not say my return side line was freezing cold, but it was cool to the touch. The non servo type monovalve is electrically controlled. It is possible that the servo type is vacuum controlled. It is hooked up to a heater hose, so that may be it. When the engine is a normal operating temp, one side should be cooler than the other. Both sides having the same temp means either the heater is on, or the valve may be defective. Yeah, the black hose coming out of it goes straight to the servo. I traced it there. I also tried manually closing the valve by pushing it forward, but didn't feel a difference in vent temps. Maybe I should try and hold it down longer, I don't know. I will still take it in on Monday to see what they can tell me is wrong. I might just do the work myself, I know I'm capable of it, I'm just not capable of diagnosing! Man I wish there were more people around me to help out! I understand that one! Lucky for JimmyL is close by. Yeah it almost might be cheaper to pay for a flight for jimmy to come down here and help me!! Welcome to the wonderful world of Auto Climate Control II! 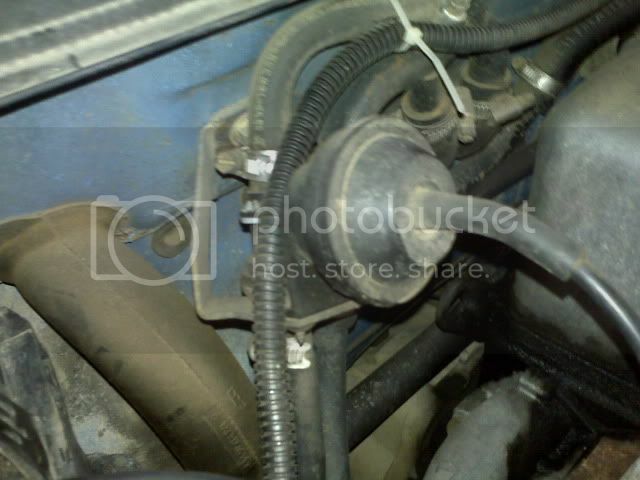 That vacuum piece in your picture does control flow to the heater core. You can test it for operation with a Mityvac. If it doesn't move then I believe your servo is sticky, most of them are. The servo tends to "stick" after some time of non-use. What I recommend to do is to move the temp wheel from cold to hot a few times, waiting inbetween selections for the servo to catch up. Also alternate pressing DEF, AUTO-HI and AUTO-LOW a few times as well. Also when I went to have my r12 charged last summer the servo system stuck on heat before charging. Following the procedure above and opening/closing that valve in the picture "unstuck" the system for normal operation afterward. The CCU (Small black box behind glovebox liner) is held on by two screws and a harness. Have you replaced it yet? Any scorch marks on the PCB? Good grief yall, I fear the CCU-II. I've never ever in my life messed with one, although I do have an aluminum bodied one out sitting on my work bench. I would first follow what derburger said and see what happens. I would want to know first if that valve you had pictured holds vacuum. If the diaphragm isn't torn then I would do as he says and start switching the setting of the CCU as he described. It sounds like Norm is trying to make cool air, it is just being over-run by heat. Okay, I will try to mityvac that valve there tomorrow when I get up. Like I said, the little lever behind it did not move no matter what setting it was on!!! I have also replaced the Amplifier (the little black box behind the glovebox) numerous times, I have three now. No difference with any of them (although the aux water pump burned out, it didn't take out the amp). Btw I love your tag, I think we need to start a club once mine is fixed! And as for the sticky servo, I'll try that but believe me I've been moving that dial and pushing those buttons so much it's a wonder they haven't melted yet! Jimmy, I think you're right (also Tyler said the same thing). I can tell that at various engine temps the heat gets higher or lower in correlation to the engine temps. You sure do have a lot of ACCII stuff Jimmy, you sure you don't want to take part in the fun?! Okay, I dropped off Norm yesterday and I should know by tomorrow or Tuesday exactly what's wrong. However, before I took it in I did mityvac that pod and it will hold vacuum. However, the vacuum line leading in to it was cracked wide open! So I mityvac'd the pod closed, and took it for a test drive. Still no dice. I was so hopeful that that's what the problem was! So he's in now, hopefully it'll be something I can fix myself. Do we have Updates for this thread ? Rebuilt Transmission at 245k miles. He can explain better, but the servo is now working fine, but no AC. I've had my issues with the climate control on my 280SE. It was working well for a time, but now is not quite right. Maybe the readers of this thread can help. I replaced servo with George Murphy's aluminum unit, along with the amplifier and aux water pump. After the car sat for some time chasing other issues, I found the AC cold and fans working, but no heat. I checked the fuse that brings the servo back to 'park' position- that now works. As does the aux water pump. I've also tested the servo at pins 3 and 5 straight from the battery- I hear the valves open and close as they should. Now here is the problem. When I measure voltage at the plug side that feeds pins 3 and 5 into the serov unit (ignition on, ACC set to 'DEF') I only get 8 or so volts. I believe this is not enough to drive the servo, so of course no heat. What could be causing this? A bad amplifier? What feeds these pins- connections from the amplifier or a direct switch from the selector switch on the dash? So I'm finally tearing in to my AC system and am at the point where I need to add oil to my compressor and dryer. Actually my compressor appears to be filled already, but I want to drain and refill it for peace of mind (unless that is a bad idea and I should just leave it). Anywho, where am I able to pick up compressor oil? I can't seem to find it at any of my local autoparts places, and ordering it online seems to be my only option. Does Mercedes carry this at their dealerships? Also where am I able to rent a vacuum pump from to remove all the moisture from the system? Or am I stuck buying one? So far I have everything out and have flushed the system, just need to oil the compressor and dryer, tighten everything up, pull vacuum for a bit, and charge it.